Guide to Chinese - iKnow! The following guide is designed to help you understand how Chinese works so you can input Chinese in the iKnow! app. At first glance, Chinese can appear intimidating, but after you learn a few rules about tones and pinyin (a phonetic system for writing Chinese based on the western alphabet), you'll be able to input Chinese in iKnow! without any problems. To give one example, the sound da can mean "to hang" (1st tone), "to answer" (2nd tone), "to hit" (3rd tone), or "big" (4th tone). The tones are indicated by a mark above the word which roughly represents how the word is read. Note: a neutral tone can also be indicated by the absence of a tone mark, or by a dot before the word, as in .da. Typing tones is easy. To indicate the tone, first type the word in pinyin followed by 1, 2, 3, 4. 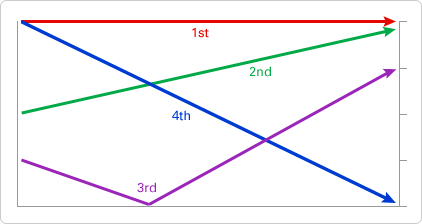 These numbers represent the first, second, third, and fourth tones. For neutral tones, you don't need to input a tone number. iKnow! automatically converts these numbers to the tone marks (the dash above the word indicating tone). For example, to type dàibiǎo—which is dai (fourth tone) and biao (third tone)—you need to type dai4 biao3. Please note that direct Chinese character input is not accepted for Chinese courses, so you don't need to have Chinese IME installed. Just type as you normally would on an English keyboard. There is only one special character you need to know when typing pinyin: ü. To type ü, you have to use the letter "v". All other sounds are typed exactly as they appear in pinyin.